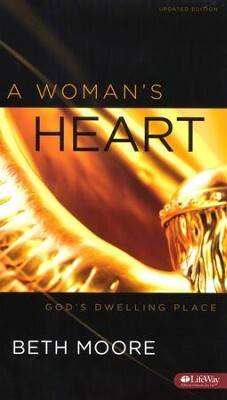 Discover the parallels of the Tabernacle's building and your life as a chosen vessel of God. Taken primarily from the Book of Exodus, A Woman's Heart: God's Dwelling Place by Beth Moore will take you on a fascinating journey into why God would chose to live in a wilderness tabernacle, made by human hands. Audio selections from taped video presentati ons make this a great tool for catching up on missed sessions or reviewing lessons. 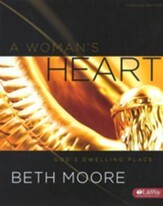 A Woman's Heart: God's Dwelling Place - Audio CDs by Beth Moore contain the audio portion (11 CDs) of the teaching segments in this 11-session, women's Bible study. 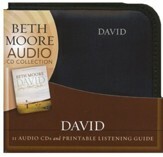 The set comes in a CD-size zipper case and a PDF of the listening guide is included on the first CD. Great for extended groups, catch-up sessions, or leader/participant personal review. Explore the fascinating account of the building of the Old Testament tabernacle, the significance of its intricate design, its pivotal role in God's eternal plan, the grand fulfillment of its purpose by Jesus Christ, and its variety of meanings for your walk with God today. Perhaps no Old Testament event so dramatically illustrates God's persistent desire to relate to His children as the building of the tabernacle in the wilderness. Through the tabernacle God initiated a deeper relationship with His Chosen People by bringing reconciliation and revealing His glory. And certainly, no Old Testament event so richly prefigures the coming of the true Tabernacle, Jesus Christ. You will be challenged to prepare your heart, like the holy of holies, to become a home for His love and glory  a dwelling place for the Most High God. I'm the author/artist and I want to review A Woman's Heart -Audio CDs, Updated.